On this day in 1491, the siege of Granada – the last Moorish stronghold in Spain – begins. On this day in 1947, the Hollywood Ten are blacklisted by Hollywood movie studios over their supposed ties to communist and left-wing organizations. From Ring Lardner Jr. to Dalton Trumbo, this august group includes some of the finest writers and performers to ever work in the entertainment industry. On this day in 1960, three of the Mirabal sisters – four Dominican political dissidents who opposed the dictatorship of Rafael Trujillo – are assassinated. In 1999, the United Nations establishes the International Day for the Elimination of Violence against Women to commemorate these murders. 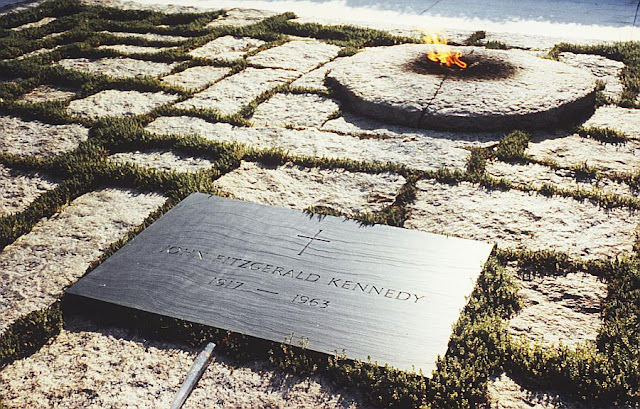 On this day in 1963, assassinated President JFK is buried at Arlington National Cemetery. On this day in 1970, Japanese author, poet, playwright, film director and militaristic right-wing cult leader Yukio Mishima commits ritualistic seppuku - suicide by gutting one's self with a katana blade - after an unsuccessful attempt to overthrow the government in a coup designed to bring back Emperor Worship in Japan. If you haven't already seen it, I highly recommend watching Paul Schraeder's unjustly overlooked masterpiece of a biopic, Mishima: A Life in Four Chapters. And speaking of coups, it was on this day in the year 1973 that a bloodless military coup headed by General Phaidon Gizikis, Prime Minister Adamantios Androutsopoulos and secret police chief Demetrios Ioannidis ousts Greek President George Papadopoulos. You know, next to being a public school science teacher in the South, being a tombstone engraver in Greece must be the most frustrating job in the world. On this day in 1981, Pope John Paul II appoints Joseph Cardinal Ratzinger Prefect of the Congregation for the Doctrine of the Faith. Ratzinger would go on to succeed JPII as Pope Benedict XVI, or, as I prefer to call him, “Ratz Benedict”. On this day in 1984, 36 top musicians gather in a Notting Hill studio and record Band Aid's "Do They Know It's Christmas" in order to raise money for famine relief in Ethiopia. On this day in 1986, Reagan Administration officials announced that some of the proceeds from the sale of U.S. arms to Iran had been diverted to Ollie North, who used the funds to support the Contras in Nicaragua. According to Reagan's logic, only left-wing rebels could be called terrorists. Right-wing rebels were "freedom fighters," even if they spent most of their time burning down orphanages and decapitating nuns.